It's game time. You're hosting, which makes you the quarterback of the party. Your friend blitzes you with a six-pack of warm beer. Don't let this blitz get in the way of getting blitzed. Here are two tried and true fast beer-cooling techniques... and one harebrained scheme. It's Friday afternoon, you've made it through the long week, and it's time for Happy Hour, Gizmodo's weekly booze column. A cocktail shaker full of innovation, science, and alcohol. TOUCHDOWN, let's spike the punch! This is the beauty of chemistry. Salt lowers the freezing point of water significantly. Fill a cooler with plenty of ice, salt, and water. It should be nice n' soupy. 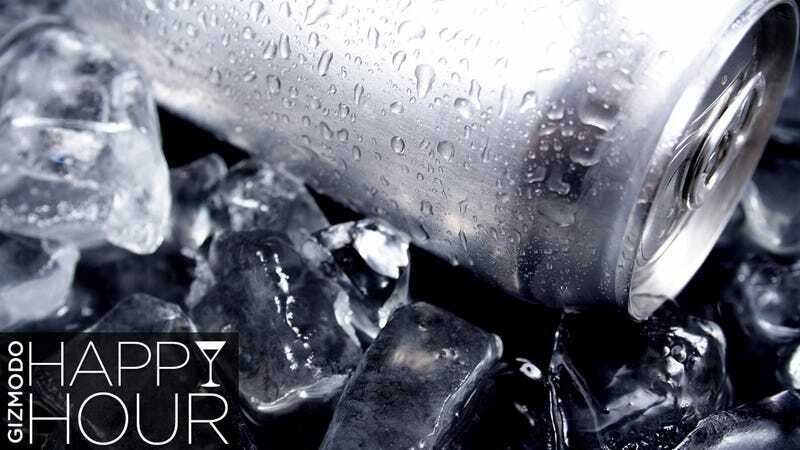 Cubes of have only so many points of contacts with a can of beer, whereas a solution like water can completely cover it in coldness, plus the solution will be about 25 degrees Fahrenheit. Using this technique, it's possible to get room-temperature beer down to the mid-30's in less than 5 minutes. The only drawback to this technique is that by lowering the freezing point of the water the ice is going to melt fast, and once it's all melted the temperature will rise again. This means you going to have to drain some liquid out of the cooler and continue adding more ice at regular intervals. Not ideal in the middle of a close game. That said, it's a reliable solution that's safe for cans or bottles, and is probably your best bet. This one has the benefit of convenience. You might not have a cooler you can fill with a ton of ice, water, and salt, but there's probably a freezer nearby. Just putting it in the freezer commando isn't going to help your situation very much—you need to wrap it up, son! Take a couple paper towels and wrap them around your beer, then douse it in water. It should be soaked but not dripping (you don't want ice forming in your freezer). Air is not a very good heat-conductor. Water is a better conductor, plus you get a little boost from evaporation. Pop it in the freezer for 8-15 minutes, depending on the freezer's temperature (err on the side of caution). There are definitely drawbacks to this method, the biggest one being that you must not forget about the beer in your freezer. Which, y'know, you're likely to do when you're drinking beer. Set a timer and don't forget it. If you leave it in too long the can or bottle may explode. Which is bad. In fact, you probably shouldn't try it with bottles at all. It's no where near as efficient as the salty ice-water technique anyways. Not only does it take longer, it won't get as cold, and you have to wrap each beer individually, which wastes time and paper. But, it's also not the worst option out there. Get a length of 3/8-inch copper tubing from a hardware or plumbing store. I just found a 25-foot roll for $27. Perfecto. Attach one end to the inside of your cooler's spigot (it will lets excess water out) and seal it in there with 100% silicone sealant. Make sure it's non-corrosive and non-toxic. This must be water-tight. If you have a better idea than silicone sealant, do it. At the other end of the tube, attach the funnel, using sealant or duct tape—this one is a little less critical. You'll have to let it set for 24-hours. Once it's dry, space out the loops a bit so they're not touching each other, but make sure they are stacked correctly, so that the spiral is continuously going downwards. I'm going to see if I can space them out by cutting holes in scrap styrofoam. How much tubing you'll need depends on how big your cooler is, but to a certain extent, the longer the tube, the colder the beer will be when it comes out. Now put the cooler on a table (or a stool in the bathtub, if you want to be careful) and fill it with ice (as much ice as possible, remembering to keep the coils straight). Have it so the hose comes out of one of the sides, and so you'll be able to mostly close it later. Now add a bunch of salt. A cup? Maybe two? It'tlDepends on how big your cooler is. Fill it the rest of the way with water. If you sealed everything correctly there should be no water leaking out of the spigot. Close the lid as much as possible (with the funnel still sticking out), and tape the lid to the rim to help prevent heat-loss. Flush the tube out with water once (if you haven't already), and then you should be ready for game time. This method should allow you to pour a warm beer into it and have it come out icy cold in less than a minute. What's the point? Your cooler and fridge can only fit so much beer. This way you have unlimited storage and unlimited cold beer. You can do one at a time, and your friends will be wowed by the geeky scienciness of it. The reason this one is better than the one made by the Mythbusters (no offense Adam) is on their first try they used dry ice, which froze the beer. The second time they just used regular ice, which didn't get it cold enough (and it leaked like crazy). This should be the happy medium. When the game is over, you should be able to scrape off the silicone sealant and your cooler will be back to normal. The Disclaimer: I haven't tried this yet. But I'm going to this weekend, and I will document how that goes. Also, don't judge my total lack of art skills. Glorious leader Joe Brown made me do it. UPDATE 2: Failure. But an interesting one. Had everything set. Camera rolling. I poured the beer in, and... it just stopped. It refused to go through the tubes. I pulled the funnel off and blew it through (which took a lot of effort). I thought it must be so cold that it was freezing in there, but then water streamed through just fine. I did a few more tests (wasting three beers in the process), until I finally found the culprit. Carbonation. The carbonation causes air pockets (or gas pockets, really) to build up in the tubing. The gas wants to rise while the liquid wants to fall, but because the tube is pretty narrow they come to a standstill until one moves to the side enough for the other to slip by. Because of the tube's low-grade decline, gravity isn't strong enough to pull it all through. This is why jockey boxes use a keg's pressure to push it through. I tested this theory by sending carbonated water down, and sure enough, it got stuck, too. To be fair there is a bit of unevenness in the downward slope of the tubing (it was hastily thrown together on a Friday night), which definitely adds to the problem. It would also probably help if I took another loop (~42 inches) out to make the decline steeper. The good news is that the 66-degree beer was 39-degrees when it came out. The bad news is that it was fairly flat, and I had to blow into the pipe like Louis Armstrong to get it. Not worth the trouble. But I'll do some tinkering with the design and we'll see what's what.